5B&Co. Candlemakers in Brookside is a specialty candle shop owned and operated by Lori Woods. The company has been a Kansas City tradition for over twenty years, originally founded by Marsha Flowers in Weston, Missouri. In 2003, Lori opened 5B&Co. in her neighborhood of Brookside. 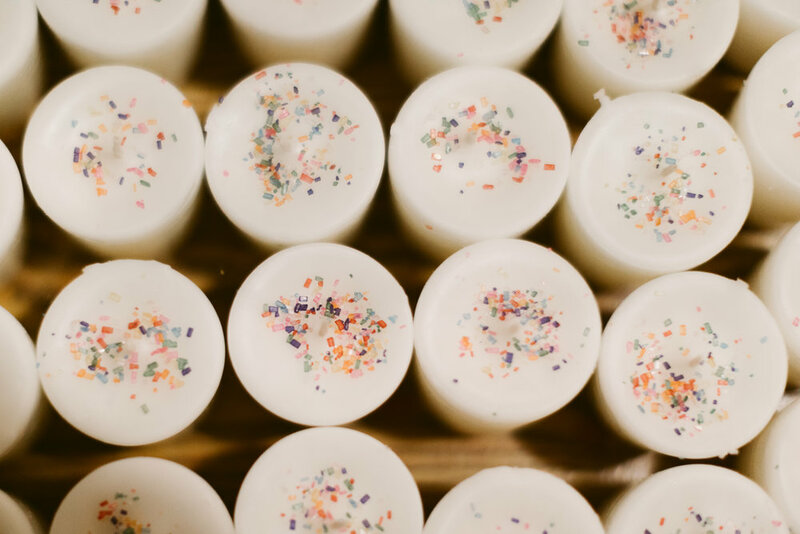 The company has earned a loyal following for the cozy, delightfully-scented candles that are hand-poured with top-quality oils, lead-free cotton wicks, and clean burning soy-blended wax right in the back of the shop. They pour over 170 scents, ranging from classic and creative to seasonal scents to warm the home for the holidays. When did you first discover 5B&Co. and what inspired you to open your own shop? I discovered it in November of 2002. I was teaching a 4/5th grade class at the time. I was in Weston for a family day with my mom and sister. The small 600-square-foot shop was so charming and smelled absolutely amazing. I am particular with fragrance. I do not care for the spiced candles or sugar cookie candles that small craft towns are typically known for. This was completely different. Unique authentic fragrances being poured in the back of the tiny shop. Trays of warm candles being brought out for shoppers to hold and sniff. The names were quirky and spot on. I bought a dozen votives to give them a test drive. I reached out to the owner to ask if she would ever be willing to let me open a store in Brookside (where I live). She was lovely and said she would entertain the idea. I met her in December and within 6 months I had the doors open to my current space in Brookside. 5B&Co. has over 170 scents – that’s amazing! How are the scents formulated? We work with many different oil companies. I buy the best of the best. For example, you would think grapefruit oil is grapefruit oil BUT every company produces their oil differently. There are also different degrees of quality. You get what you pay for. I do not skimp on the quality of oil. Some oils I love as is directly from the bottle. Other scents you find at 5B&Co. are unique to us as we have developed the scent formulation. We also have private labeled for several companies and have collaborated to make a scent unique to their business. What are your favorite Christmas scents? Candles are all produced on site at the Brookside location. I compare the candle making process to making a batch of cookies. The yield of a batch of votive candles is similar. Also, if you tweak the recipe this way or that you will end up with a different product. A recipe needs to be followed. What are the best parts about calling Brookside home for 5B&Co.? Definitely the neighborhood and the neighbors. It’s a walking community that is loyal and appreciates supporting local owners and appreciates stellar personal customer service. What have been some of the most memorable moments of your journey with 5B&Co. over the years? Taking part in people’s special occasions. Weddings, births, celebrations of life. Scents evoke memory and there are many stories people share with us. We love to hear them and connect with them. We had a friend this past year that went through a major battle with cancer. We made votives in her favorite scent and she passed them out to over 200 people and they all lit their candles during an intensive surgery. Today she is healthy! The flicker of a flame can unite people in many ways. Is there a candle that brings back memories when you smell it? There are many. Some are personal and emotional, others are just fun or silly. Some mark milestones for me here at the shop. For instance, Flower Shop is the first batch of candles I poured here at the Brookside Store. Lemon Bar reminds me of the first batch I poured in the Weston location. Sandalwood reminds me of my father. Why do you think candles make such perfect gifts? They are a treat! Not everyone treats themselves to relaxing, chill time. The power of scent and the flicker of a flame can be a mood changer. You can hit any price point, with a small gift under $10 or a larger $40 candle. Do you have any special Christmas traditions in the shop? Every year we hold a candle lit Christmas party to show appreciation for our customers. It’s a fun, festive night of shopping and mingling. brings health to the home and wealth to the pocket!